On Saturday October 13, 2018, Our Promise to Nicholas Foundation (OPTN) https://ourpromisetonicholas.com/ will host the sixth annual memorial run in honor of John Tanner. This year the name is changed to the Pumpkin Shuffle 5K Run/Walk in honor of John Tanner. The race will start at 11:30am behind Russell's Garden Center, Wayland MA. 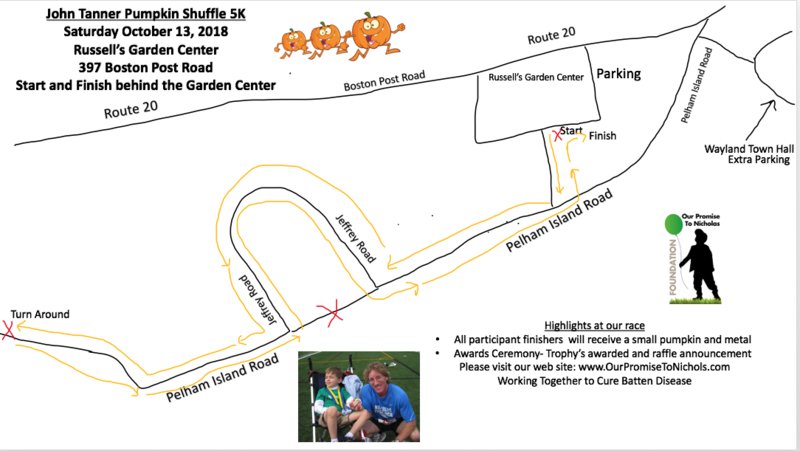 The race route will be on Pelham Island Road heading west 2.5K and then return east on Pelham Island 2.5K to finish behind Russell's Garden Center. You may park behind Russell's Garden Center (more detail information will come about parking, please check back closer to the date of the race). Registration and number pick up will be open the day of the event at 9:30am. All monetary proceeds raised by this event will go toward science and research for a cure toward a childhood brain disease called Batten Disease. Please visit the web site http://www.ourpromisetonicholas.com for more information about this 501c-3 non profit charity. Directions/Parking: Russell's Garden Center - 397 Boston Post Road, Wayland MA. You may park behind Russell's Garden Center near the start and finish line. John Tanner, 47 was a longtime friend and employee at Russell’s Garden Center in Wayland, MA, who unexpectedly passed away while running the NYC half marathon in the spring of 2013. John was an exceptional athlete and competitive runner who devoted all of his races over 5 years to raising awareness about Nicholas and Batten disease. Nicholas's parents Heather & Chris (Noyes) Dainiak were native residents of Sudbury and Nicholas's grandmother Dotty Noyes worked with John for many years. Sadly Nicholas lost his battle to the disease on his 11th birthday on May 9, 2014. In keeping our promise to Nicholas and John, we will continue to work toward a cure for this childhood brain disease. Contact: Heather- heatherdainiak@hotmail.com with any questions.